Shrimp & Pesto Pasta Recipe! 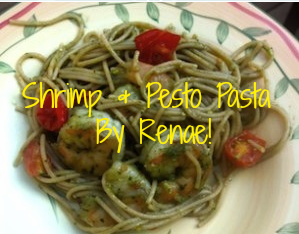 You are here: Home / Recipes / Dinner / Shrimp & Pesto Pasta Recipe! This is a simple recipe that is packed full of flavor. Use whole wheat pasta to make a healthier version of Shrimp & Pesto Pasta. During the warmer months, use fresh basil from your garden to make the basil pesto! In a large pot boil water and cook pasta according to package directions. While the pasta is cooking, place the olive oil in a skillet over medium heat. Add pressed garlic. Cook garlic for two to three minutes. Add the shrimp to the skillet. Cook until the shrimp is pink. When the shrimp is cooked, add the pesto and cherry tomatoes to the skillet. Cook for two minutes. When pasta is done, drain the water. Add the pasta to the shrimp, pesto and tomato mixture. That’s it! So easy and what a hearty meal, too!